Our lowest-cost, simplest rowing option for inflatables, seen here at sunset on a Sevylor SVX500, consists of our rowing outriggers, a pair of sockets for them that you bolt to a board (1 x 10) that you lay across the side air chambers, lift blocks for the oarlock sockets and 3 long straps. Oars, oarpins and stabilizers are sold separately. In the next 2 pictures we show this same set-up on a Kaboat. Saturn Kaboat with our basic rowing setup Close-up of rowing outrigger on Kaboat. Mirrors sold separately. We have a sliding seat for cano/www.sailboatstogo.com/content/Rowinge rowing that could be adapted to an inflatable -- we just haven't done it yet. The one pictured was discontinued, but the new one is even better. We are offering it for canoes. If interested in one for an inflatable kayak, send us an email at Jim@sailboatsToGo.com and we'll get this project off the back burner for you if we can. You can see the new sliding seat if you hunt for it on the canoe rowing page (scroll down when you get there). What could you make with a pair of these? One customer wanted sturdier oarlocks for her Mariner 4 inflatable dinghy and a high, firm seat to give her a better rowing position. 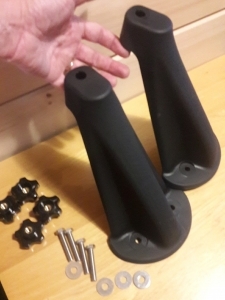 She bought these oarlock towers from us and mounted them to a board put across the boat that she sits on. See next picture. Mariner 4 Inflatable dinghy with "oarlock towers" from SailboatsToGo mounted to a home-made wood rowing seat. Customer says it works super great!